UPDATE *** Shayla was able to find a local foster to keep Oreo and Socks safe during her training. Thank you to everyone who shared their story! Shayla is a member of the US Army who is preparing for basic training and tech school. She will be away from her home and her pets from 2/11/2019 – 9/1/2019. PACT is looking for a foster near her home in Edmore, MI, to care for her two kitties for the next 7 months. Oreo is a 1 year old 15lbs neutered male Tuxedo cat. Socks is a 1 year old 15lbs neutered male Tabby cat. These boys are very friendly, and have been raised together since birth. 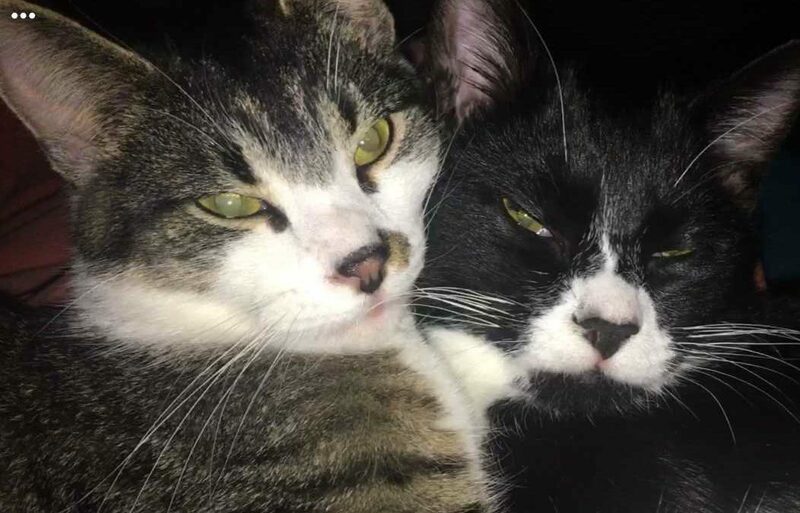 Socks and Oreo love to play and cuddle with each other and their owner. Shayla reports that the boys don’t do well with other cats, and will need to be in a foster home without other pets. Otherwise, they are energetic and playful and very entertaining! If you are interested in fostering wonderful pets like Oreo and Socks, please fill out a Foster Family Application. If you are interested and have already completed your Foster Application, please email info@pactforanimals.org and let us know!